Kicking slat coffee table design up a notch. 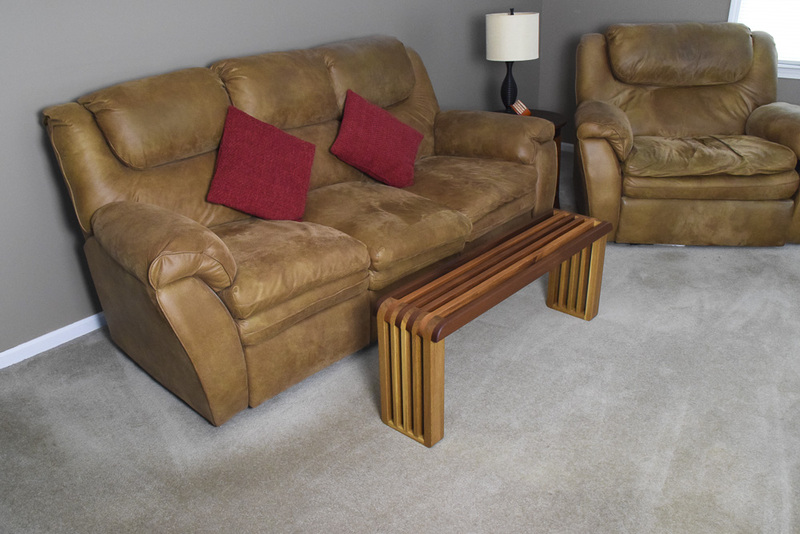 Sturdy quartersawn white oak and rich sapele mahogany combine to make an elegant yet practical furniture piece. 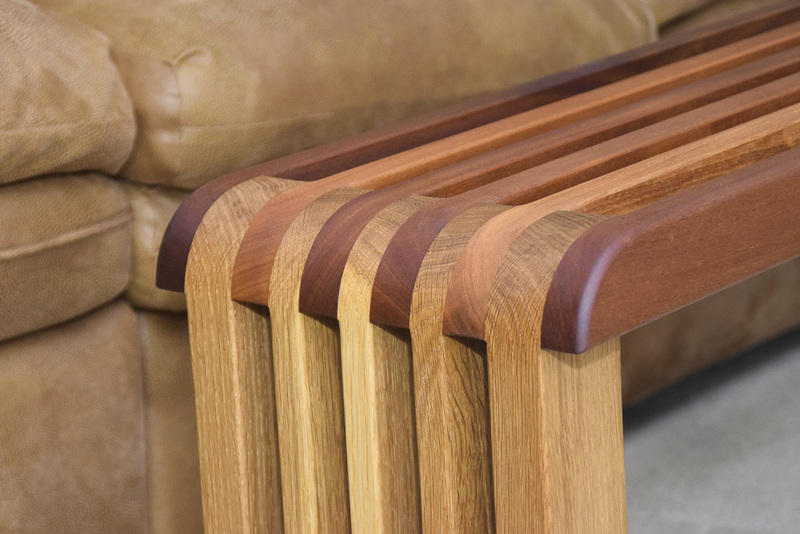 Bulky stock material supports the claim of the strength of the piece while the large radius of the table ends combined with the smaller curves of the leg bottoms and edges really softens the overall look.Edges have been eased to a 3/8″ radius on the outside edge and 1/8″ everywhere else. 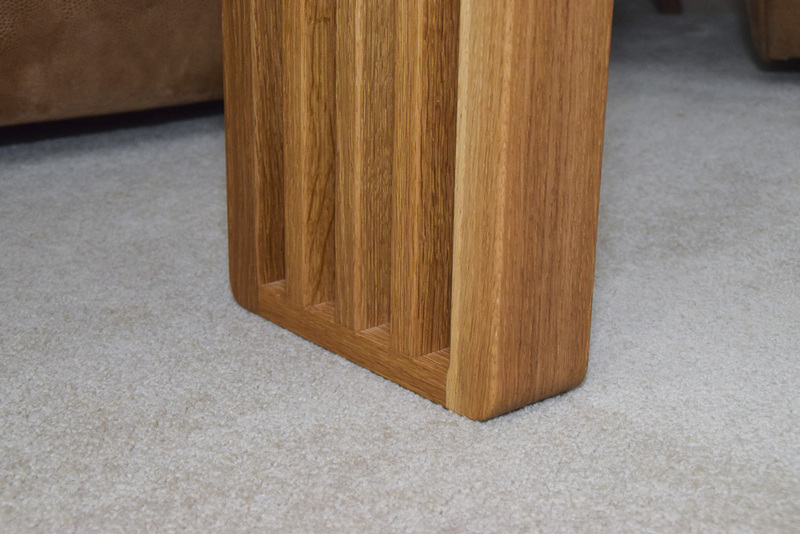 Plenty of structural support is achieved by epoxying together the fingered joints and the addition of 3/8″ oak dowels thru the fingers (the outer slats cap the exposed dowels for a cleaner look). The leg assembly uses a combination of stainless steel screws and domino joinery for strength. 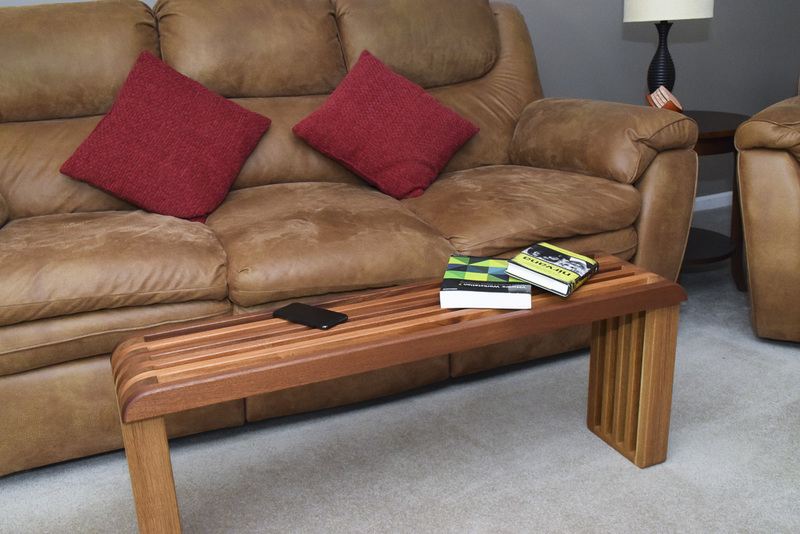 Used as is, this slat coffee table will complement any modern decor while only taking up a small footprint yet still providing ample usable surface for reading materials, tv remotes or centerpieces. 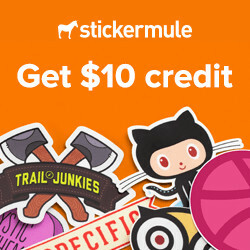 Looking for a larger ‘storage’ surface? Add a rectangular or oval piece of beveled glass. Although this piece is marketed as a table, it can also function as a bench. It’s the appropriate height, 18″, and I’ve tested its rigidity by sitting on it. No flex, no creak. The finish applied is Rubio Monocoat pure oil, delivering a durable protective layer and a matte sheen. 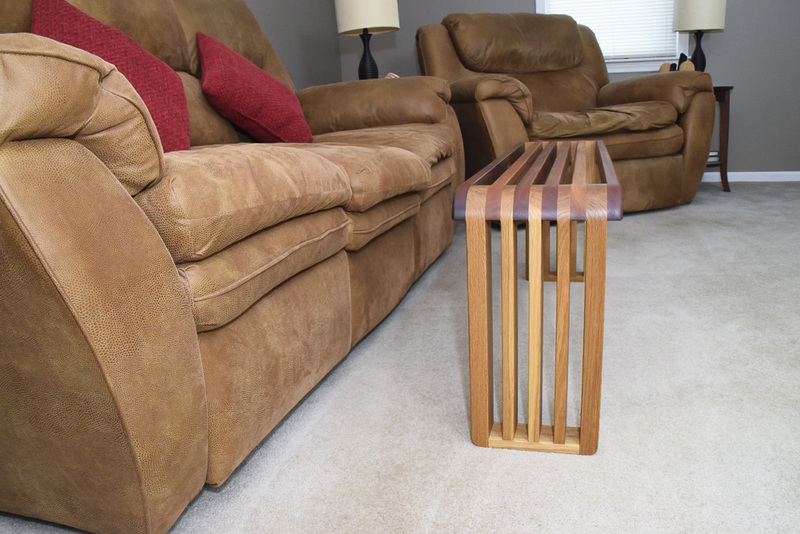 Read about the build process for this table or watch the video of the finishing process. 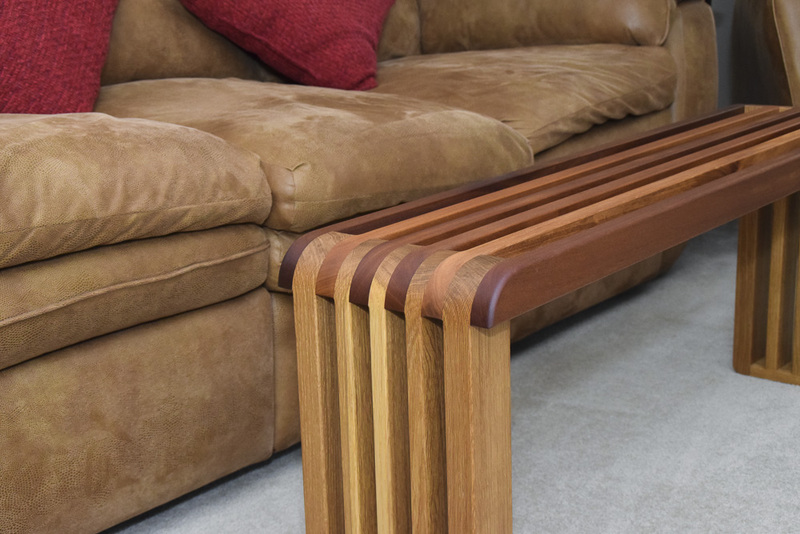 Sapele slats are 1″ x 2″, the white oak legs are 3/4″ – 1 1/4″ thick in a 2 1/8″ wide assembly.